Following on from Major Arcana Tarot Card Guide: Part 1. A complete deck of Tarot cards has 22 Major and 56 Minor Arcana cards that all have different definitions that can reveal situations in a reading. During your reading, a psychic will analyse the symbols and emotional meanings of cards selected to create a sequence that will tell a spiritual story about your future. Major Arcana cards represent significant events and powerful influences that can alter our future. When you receive one of these cards in a reading, it is telling you that you recently have or are about to make a very significant decision in your life that will begin a new chapter. 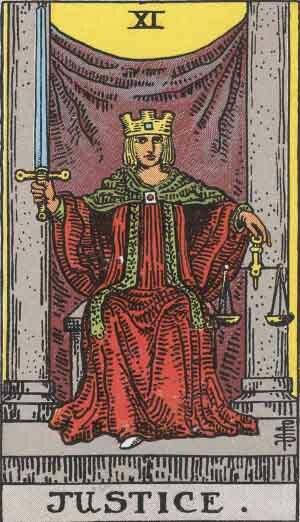 Each Major Arcana card has a Roman numeral at the top starting from 0-21. These numbers symbolise their journey throughout the deck and can also reveal the stage of your life or close relationships. All Tarot cards shown below are from the Rider-Waite tarot deck, also known as the Rider-Waite-Smith deck. The Chariot is a man who is going on an epic journey towards success by riding with two horses. If you look at the card, you will notice that none of the horses have any reigns. It represents his ability to control the situation without force. He is fully able to guide the horses to where he needs to go with his pure ambition and determination. 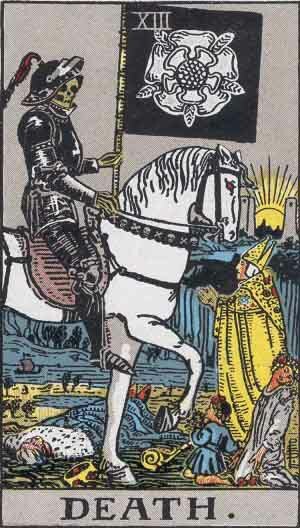 There is popular belief that the light and dark horse represent positive and negative situations that could be revealed later on in the quest. In a reading, this card symbolises a new career or relationship that goes well without much effort. The more you try and push for something to happen before its time, the more likely it is going to fail. The card tells you to carry on towards your destination, keeping an open mind. A horse is also an animal that often represents sexual desire, so it could reveal that you do find a new partner that gives a great spark to your life. The card also warns you to stay away from arrogance because if you spend too much time around narcists, it could quickly turn you into someone you are not during your journey. These people can easily change your direction and lead you down the wrong path. It could be a new colleague who shows their greed after they first meet you, which is why you can’t allow them to tempt you with offers full of money. Key meanings: Balance, peace, agreements. 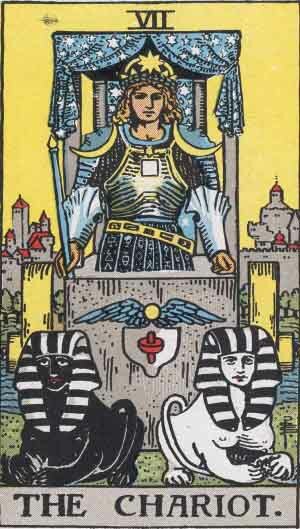 Justice is shown as a woman who is sat on a throne holding a sword and scales. The sword symbolises democracy and the scales are representing a situation that has finally balanced. Ruled by the sign of Libra, this character wants everything around her to be peaceful where people find agreement. Arguments and aggression are what she tries to avoid at every cost throughout her journey towards happiness. In a reading, the card shows you that there is or will be a resolution. This will balance out respect and responsibility in life so you can continue working towards success with a happy head on your shoulders. It can also represent a recent struggle to find fairness in a situation. You may have experienced someone being very unethical towards you, no matter how much energy you put into a relationship or career. Thankfully, this negativity will soon begin to fade and the new chapter you embark on will be full of positivity. Key meanings: Retreat, intuition, departure, self-analysis. Symbols: Lantern, path, hourglass, snake. 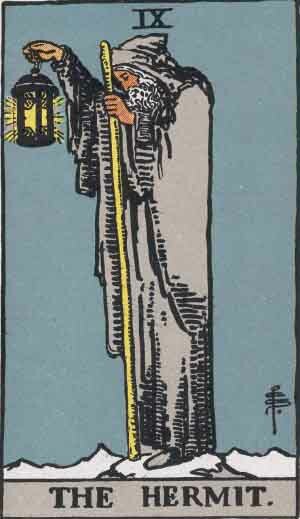 The Hermit is an individual dressed in a cloak which is walking on a path with a lantern to guide him. The journey ahead is rather uncertain to the point where he is looking for hints and clues so he can follow the right direction. There is a lantern above his head which represents his older age, meaning he shouldn’t wait too long to do what needs to be done. If he waits any longer, a brilliant opportunity could pass him by, which is the situation he needs to avoid. In some Tarot cards, there is a snake that wraps around his walking stick which promotes a time of healing. In a reading, The Hermit is telling you that you should spend time alone yet shouldn’t take too long to return to your everyday life. If an unfortunate event has brought on stress, time on your own to heal and reflect is what is best for you. It could be time to grief or to create a plan to follow for the year. The card also asks you not to ignore everyone around you completely. If you explain how you feel to others, they will respect your choice to withdraw yourself for a little while. Friends and family might give you advice based on what they have experienced in their life. It will be good advice that you shouldn’t turn away. If you act disrespectfully to people who just want to help, it could isolate you even more but in a negative way. Key meanings: Fate, luck, joy, change. Symbols: Wheel, woman, man, struggling people. The Wheel of Fortune is a very interesting card. A woman is sitting at the top of the wheel, surrounded by a glorious sun whereas there is a man at the bottom struggling to hold the wheel while a dull land surrounds him. People on the sides of the wheel are going up towards the top and down towards the bottom. 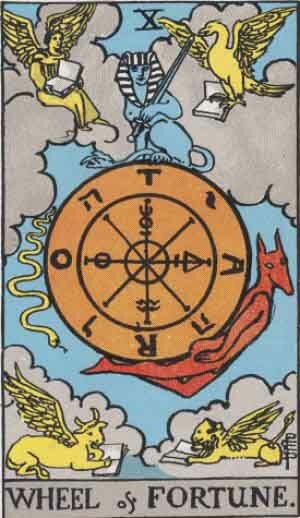 It symbols that even though you could be sat at the very top of the wheel, experiencing great joy, there will be a time where it all changes. 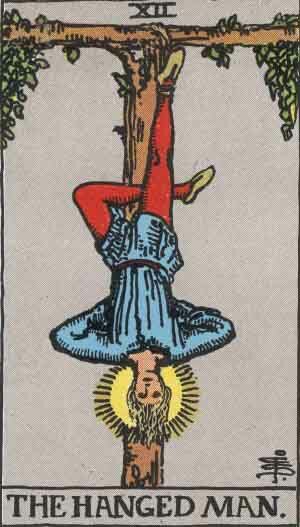 The same goes for the man who is struggling because the card tells us that he isn’t going to experiencing it for long since the other person will reach the bottom and take his place. In a reading, it symbolises that what goes up, must come down and visa-versa. If you are experiencing a negative time, please remember that it is only temporary. There is going to be a change of fate, whether it’s for better or worse and you must rise to the challenge. Appreciate the joys in life and don’t become too overwhelmed when a difficult circumstance comes round the corner. It’s so important that if you keep your head held high if you suddenly experience a bad time. The storm will pass and you will see the beautiful rainbow that forms at the end. Don’t struggle to change something that is out of your hands. Sit tight and have a little patience. Key meanings: Bravery, perseverance, determination, risk. You might look at this card, believing the woman is crazy to try and tackle a lion twice her size. If you look closer, you will soon understand it’s real meaning. The woman isn’t battling this lion and she is showing no struggle. 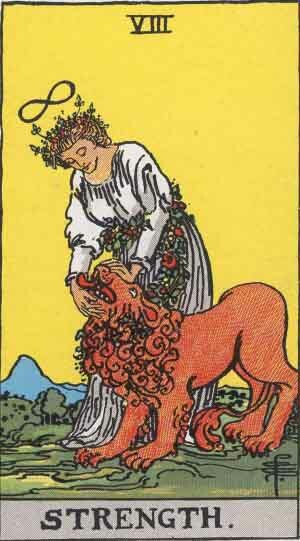 The lion has no dominance over her because it is sat down and she is above it looking downwards. She is restricting the lion’s power but not harming it. There is a risk of the lion biting her because she is holding its mouth but it’s in a calm way. She is meant to be an inspirational character who has gumption and perseverance in life. In a reading, it will tell you it’s time to have courage before you face a challenge that could get in the way of your path towards happiness. You will overcome these obstacles but only if you stop yourself from being too forceful towards others. Be more subtle with your actions and language so you can avoid any confrontation. Be careful and stay calm in stressful situations. You could soon turn into a lion that attacks and makes a situation much worse. It could even damage other peoples’ opinions of you, which is the last thing you want. Get people on your side instead of making enemies. Key meanings: A different way of thinking, anticipation, liberation. Symbols: A hanged man, a tree. When people here “The hanged man”, the can jump to conclusions very quickly. If you look at the card, you will notice that the man is hanging by a foot in a more playful way. His face is calm and he appears to be waiting and relaxing. He shows absolutely no sign of stress, which is why people should think very differently about this card. If it shows up in a reading, it is telling you to take a time out from a situation. Once you take a step back, you might begin to change your views completely. Something that once meant a lot to you might not have any real purpose in the life you’ve built for yourself. Once you realise there needs to be a change, you need to wait before making any drastic action. It is especially important if you are very unsure of where you stand in a situation. If you are unhappy with a job or a relationship, it urges you to wait until you gather more evidence before taking a leap. The card also warns you not to wait too long to make a decision. If you don’t take responsibility and control over your life, you could end up sitting in an unfulfilling situation for years to come. Key meanings: Endings, beginnings, reflection, transformation. Symbols: Woman, sunset, rose bud. Yes, this card looks pretty negative at the first glance, doesn’t it? It has the Roman numeral for thirteen above it and it reads “Death”, so we don’t blame you for being a little worried if this appears in a reading. We have some much-needed light to shine down on this card. Even though it looks like the lady is mourning, it is meant to symbolise endings but a new beginning in life. Not all endings are harmful and it could be something that was supposed to happen for quite some time. The sunset represents an end but the lady is holding a rosebud which will grow into a magnificent flower. If this appears in a reading, it is telling you to embrace change in your life. Without change, there is no progress. Even if something isn’t great at first, it’s all for the best. You just don’t know it yet! The light will appear in your life, so hold onto your positivity through this time of darkness and uncertainty. The card also asks you to avoid holding onto something that has expired, such as a relationship or job. If you aren’t happy, it’s something you need to change. Once you listen to your gut and make a bold move, you will experience the benefits. 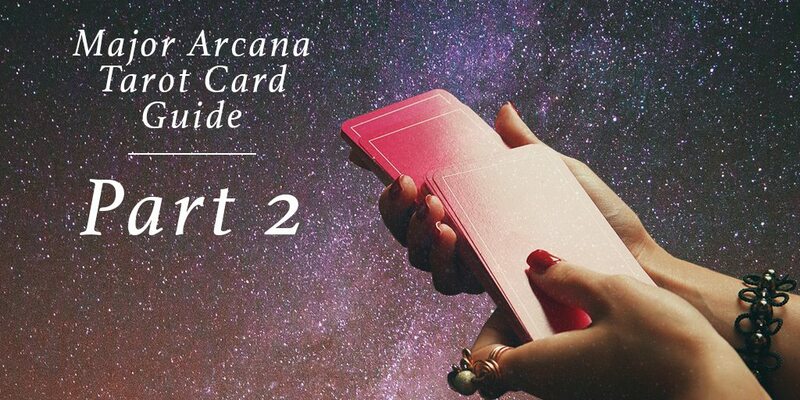 Make sure you feel a look out for our Major Arcana Tarot Cards Part 2 and 3. If you are curious about which Tarot card you are most like as an individual, take our brilliant quiz and find out today!